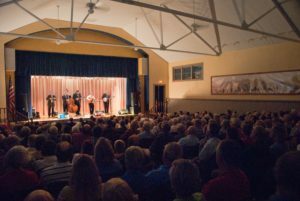 The Kruger Brothers: ‘An Appalachian Evening’ Summer Concert. Swiss brothers Uwe Kruger on guitar, and Jens Kruger on banjo, team up with bassist Joel Landsberg. Kruger Brothers performances are exciting, calming, entertaining and spontaneous all-in-one, exhibiting their sheer joy in playing music. Although each of these musicians has earned high credit for his skills individually, it is the interaction of the three together which makes their music so uniquely special. Adults $30; Students/K-12 $10; plus tax. . All concerts at 7:30 pm in the air-conditioned Lynn L. Shields Auditorium. Dinner available for purchase in the Schoolhouse Cafe beginning at 6 pm. Featured artist: Allyson Gernandt.